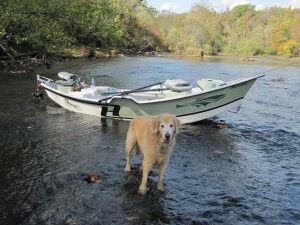 Bo got to go fly fishing this week with his friend, James Buie, and his Golden Retriever, Tippet, in James new Hyde drift boat. I have to admit that I have my feelings hurt being left behind! The Little Red River is dead low as there has not been any generation for over a week. Regardless the boys caught a bunch of Rainbows and several nice Browns. The fish were taken on a wide variety of flys including, #16 Chronics, #14 Goins Gold Soft Hackle and #10 Black Wasps with a #16 BWO emerger dropper. 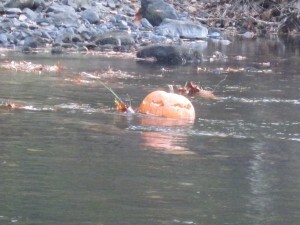 At the end of the day the boys dropped into Horseshoe Shoal and found the first “Jack-O-Lantern” hatch of the season! There was also a great Blue Winged Olive hatch and they finished the day catching several nice Rainbows on dry flys. The fly fishing is great so come enjoy the beautiful fall weather and fish the “Jack-O-Lantern” hatch with Empty Creel Fly Fishing Guides and Outfitter.